So Long Smile Lines and Crow’s Feet! Hello Juvederm Ultra Plus XC! Richmond Aesthetic Surgery is now offering Juvederm Ultra Plus XC. Juvederm is a non-surgical aesthetic treatment for wrinkles and folds of the face, as well as augmenting thin lips. Juvederm is a dermal filler based on hyaluronic acid, a substance naturally found in the body, used to smooth fine lines, wrinkles, and folds. This means it not only fills in wrinkles, it replaces what the skin has lost over time. It is primarily used in areas around the eyes (crow’s feet), the heavier folds around the mouth (“parenthesis” sign), and any other areas that may need “filling” and/or “lifting”. The primary difference between Juvederm Ultra and Ultra Plus is that the Ultra is designed more for fine lines to moderate wrinkles. The Ultra Plus creates volume for more severe folds. There are many situations where both can be used. 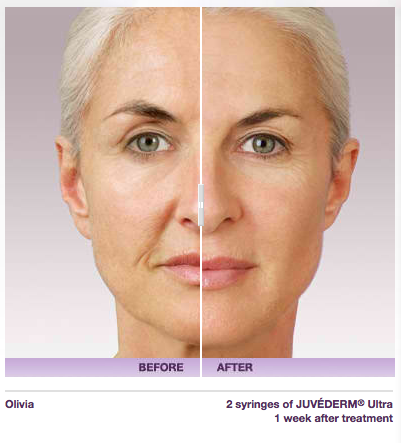 Juvederm injection is a quick, in-office procedure and you can see the difference immediately! Feel free to contact our office for a consultation.